Immanuel Presbyterian Church, located in the historic Yankee Hill neighborhood of Milwaukee, Wisconsin, has long held a place of prominence in both the religious and social lives of Milwaukee. The congregation is a direct descendant of the first congregation organized, Presbyterian or not. Fabry Inc. has had the privilege to maintain the equally historic pipe organ for quite a few years. The organ now comprises 69 ranks. Fabry Inc. has already built an all-new three manual console that replaced the aging console which itself was a replacement. We have also completely re-leathered all of the wind chest mechanisms, primaries, stop actions and pipe pouches. We were approached approximately two years ago with the idea of recreating the chancel as it once stood by removing the reredos and erecting a pipe façade. At the time we submitted a drawing laying out a possible idea and we thought nothing more of it. Last year, we were approached by Dr. Deborah Block, pastor of Immanuel Presbyterian (IPC), with the desire to move ahead with the actual replacement of the reredos and the installation of the all-new pipe façade. After much discussion, it was decided that not only would we install the new façade, we would also replicate and install new wainscoting around the chancel that would match the existing sanctuary wainscoting and demolish the existing reredos. With excitement, we accepted. Demolition began on a Sunday, following the service in the sanctuary at IPC. We had been preparing for this job for a month already, pre-constructing and finishing many of the necessary pieces. Our shop was a hive of activity as David G. Fabry, Kyle Eddington and Dan Bowman spent countless hours constructing, sanding and finishing the new woodwork. We arrived and immediately proceeded to remove all of the chancel furniture. Pews were removed to the side isles, the console, pulpit and lectern were protected, the chancel floor was covered with two sheets of plywood and carpet protecting mats were rolled out. After this was accomplished, we proceeded to remove all of the wainscoting in the chancel area. The following morning, the scaffolding company arrived to erect the scaffolding that would allow us to reach the top of the reredos so we could remove it and allow us to hang protective plastic to help shield the remainder of the sanctuary. By mid-morning on the first Tuesday, the chancel was completely shut off from the sanctuary. By the end of the week, the reredos was completely removed, the debris hauled away and the work of installation would begin. The new wainscoting, designed by David G. Fabry to replicate the original wainscoting still in the sanctuary, was installed with little difficulty. While the largest piece was 30 feet long and required all of us to maneuver it into place, it all went into place with relative ease. The foresight of Kyle Eddington in his preparations made the installation a breeze. As soon as the wainscoting was in place, the job of erecting the frame for the façade could begin. After the reredos was taken down, it was revealed that the structure holding the reredos would do nicely to anchor the new pipe façade. Platforms were constructed at three different levels. Ultimately these would help in the installation and eventual tuning of the new pipes. At the time the platforms and supporting structure were being constructed, the pipes were delivered. Arriving on a trailer and in multiple crates weighing anywhere from 200 to 1,050 pounds, these creates were maneuvered into the church, occupying either the foyer or the rear of the sanctuary. The all-new pipe façade would incorporate the bottom end of two ranks: a 16’ Diapason and a 16’ Violone. The remainder of these ranks would be housed on the platforms that would also hold the façade. 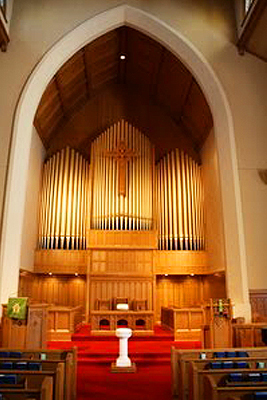 Once unpacked, all of the façade pipes took up close to half of the available pew space. The façade would ultimately hold 43 pipes. All but 8 would speak. The largest pipe, a Diapason, has a diameter of more than 11 inches. Within two weeks of being constructed, the scaffolding was removed. By the end of the third week, 90 percent of the installation was complete. All of the pipes were up. The wainscoting and trim work was installed. In two days, the final decorative pieces were added and the cross, a beautifully decorated Celtic-style design was lifted and hung from the ceiling. The passage-way used to enter the chancel from the rear is now lit with five new lights, increasing the available light. The chancel furniture was returned and modified to fit the slightly modified chancel. Four weeks after beginning the project in the church, the visual installation was finished. The final, unseen installation of the remaining speaking pipes, reservoirs, wind lines and necessary relay components was constructed and installed within two weeks. Ultimately, this project was a total success. With the help of Safway Scaffolding, Organ Supply Industries, and Immanuel Presbyterian, Fabry Inc. completed a highly satisfying project that not only will beautify the chancel of this church but also help to lead worship for many generations of congregants to come. For many pictures showing the progression of this exciting project, please visit www.fabryinc.com.